This Christmas you probably delivered an eagerly anticipated toy into the expectant arms of a loved one……..For some of us this was not into the arms of an excited child but instead those of a fully grown adult male who couldn’t quite believe that an affordable fully-functioning remote control flying machine, or ‘drone’, was now within his grasp. Here at Tweed Forum we have been exploring the working applications of this newly affordable drone technology. The most valuable use thus far has been the capture of superb aerial footage – both still and video – using a high-spec camera suspended from the drone’s undercarriage. 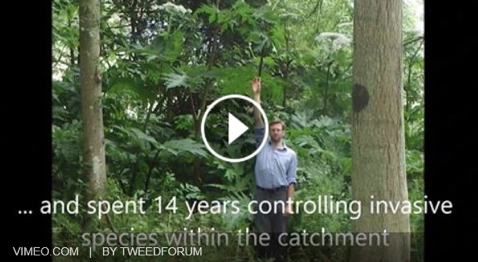 This high-definition footage is helping us deliver many of our award-winning habitat creation/conservation projects. Using the high-definition aerial footage, we can easily analyse current habitat conditions and make decisions based on a clear knowledge of what exists on the ground. We can also monitor habitat changes over time and accurately assess the impact of our projects. For example, we’ve been able to quantify how many salmon redds have been built in newly created habitat by analysing aerial footage of re-meandered sections of the Eddleston Water. In another example, we’ve been monitoring the presence/absence of invasive riparian species as part of our Tweed Invasives Project. We can also use the footage to inform and engage the wider Tweed community in the work of Tweed Forum; a good example is this short film. Drone technology is proving such a useful tool, it looks like we’ll be flying high for years to come.